BOSTON, MA, MARCH 28, 2017 – Level 3, XO, Cogent, Zayo, and Sprint have achieved a position on the 2016 U.S. Competitive Provider Ethernet LEADERBOARD, according to Vertical Systems Group’s latest research. The Competitive Provider LEADERBOARD, which ranks companies in order based on U.S. retail Ethernet port share for this segment, is an industry benchmark for measuring Ethernet market presence. Research sources for share calculations include Vertical Systems Group’s base of enterprise installations, plus direct input from our biannual surveys of network providers selling data network services in the U.S. market. 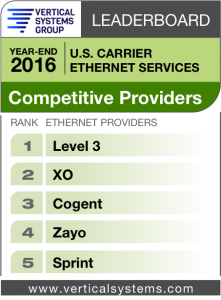 Each of these five companies has attained either a LEADERBOARD rank or a Challenge Tier citation on the 2016 U.S. Carrier Ethernet LEADERBOARD. Competitive Provider is one of three U.S. provider segments, along with the Incumbent Carrier and Cable MSO segments. In February 2017, XO was acquired by Verizon. Year-end 2016 U.S. Ethernet share figures for XO and Verizon are reported separately. Other companies in the Competitive Provider segment include the following (in alphabetical order): Alpheus Communications, American Telesis, Birch Communications, Earthlink Business, Electric Lightwave, Expedient, FiberLight, Global Cloud Xchange, GTT, Integra, Lightower, LS Networks, Lumos Networks, Masergy, MegaPath, NTT America, Orange Business, Tata, TelePacific, Telstra, Unite Private Networks, US Signal and other competitive providers selling retail Ethernet services in the U.S. Detailed 2016 Ethernet share results for the Competitive Provider segment – plus in-depth share analysis for the total U.S. market, Incumbent Carrier and Cable MSO segments are available now exclusively through Vertical Systems Group’s ENS (Emerging Networks Service) Research Programs. Expanded research coverage of year-end 2016 market share results includes Port Share Analysis, U.S. Market Update & Trends, Service Provider Profiles, Port Share by Service Provider Segment, Trends by Service Provider Segment, and MEF Certification status of top providers.